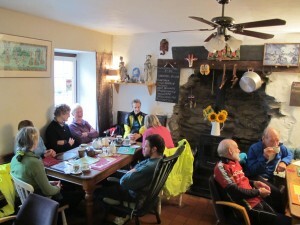 Tŷ Mawr has a very cosy tea room. The four tables – seating approximately 18 people – are all close to the fabulous centre point of the room: the fireplace. This is a multi fuel stove that not only provides a warm atmosphere in the tea room, but also heats the water and the central heating. This is an ideal place to dry out your wet walking gear overnight and in the evening to relax with a hot drink. The Tea room is open from 10.30-17.00 and we serve several sorts of tea (e.g. Earl Grey, Lapsang Souchong, Darjeeling), coffee, hot chocolate, (toasted) sandwiches, homemade soups, Welsh Rarebit, Welsh cream tea, cakes, Dutch apple pie, snacks, ice cream, fruit juices and soft drinks. Our ingredients are locally sourced where possible. The bacon and sausages come from an award winning quality butcher in Caernarfon and we use local free range eggs. Our packed lunches (£5.00) consist of a sandwich of choice, a piece of fruit, a chocolate bar, piece of homemade flap jack and crisps. We will also fill your flask with squash, hot water, tea or coffee. The tea room is closed on Mondays & Tuesdays. This may vary during school holidays, please phone us to check. We have a separate pancake menu. You can choose between sweet (e.g. 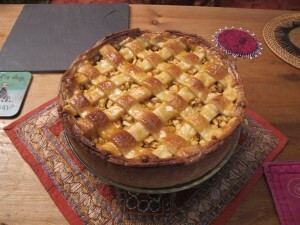 with apple, banana, honey, lemon wedges, etc.) and savoury pancakes (bacon, ham, cheese, salami, etc.). 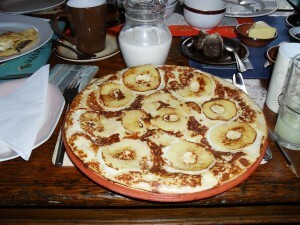 We offer medium-sized and large pancakes.